WASTE WATER SYSTEMS; SEPTIC SYSTEMS IN WYOMING ARE, BY LAW, REQUIRED TO BE PERMITTED, INSPECTED AND STATEMENT OF COMPLETION SUBMITTED. IN NON-DELEGATED COUNTIES (THOSE WITH NO SANITARIAN STAFF such as Crook or Weston) ARE SUBMITTED, DESIGNED AND APPROVED THRU WYOMING DEQ. SOUTH DAKOTA REQUIRES PERMITTING OF ATYPICAL SYSTEMS. BE PRO-ACTIVE! Septic systems, or small wastewater facility, permits are made by application. The application itself is an easy process. Consider requiring your installer to provide you with a detailed bid, and written warranty and the duration of such warranty. Ask your prospective installer if he is familiar with WDEQ Rules and Regulations Chapter 11. An installer should be very familiar with costs and have the confidence in his work to offer a warranty. Perk tests in the proposed drainfield area must be done and submitted on application. This is the determining method of soil drainage ability. 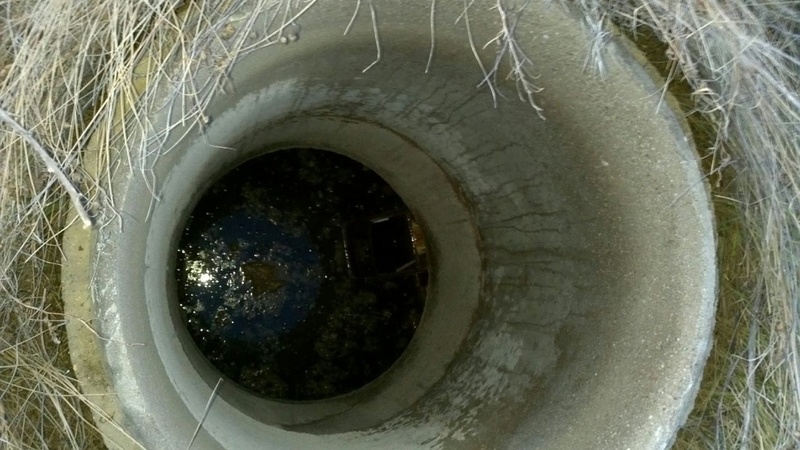 Simply a hole is dug of a particular size, filled with water a few times them filled again and measurement of level droppage over a given period of time. “Cheating” the numbers to “fit” a standard system design is not really beneficial as an under-designed system will most likely fail at a shortened life. The application will require drawings depicting minimum distances from potable water sources, moving live water, streams & rivers, natural drainages, canyons, cliffs or draws, property boundary, and structures. Ask your Realtor how your prospective property will be affected by these land features wwhen you proceed to have a system installed. AND just because a property has an existing system does not mean it was an appropriately designed, permitted and inspected system. Be Pro-Active! The system is designed, your contractor installs, leaving the system uncovered. The DEQ inspector/agent looks prior to covering, may make drawings and does take measurements to be certain compliance is made. Photographs the system. Anything you are given MUST be signed and mailed to DEQ for full compliance. You should request, and be certain you receive, full copies of the application, any changes, and full copy of inspection report. If you are available, be Pro-Active, photograph the installation process! A normal/average system costs $4,500.00 to $6,000.00, elevated pump systems are usually $2,000.00 more. I see I need to educate you on septic systems, they are not a holding tank, so of course they are full, it is how they work! Solid effluent constitutes about one pound for every 150 gallon amount of sewage, not all effluent waste sinks. 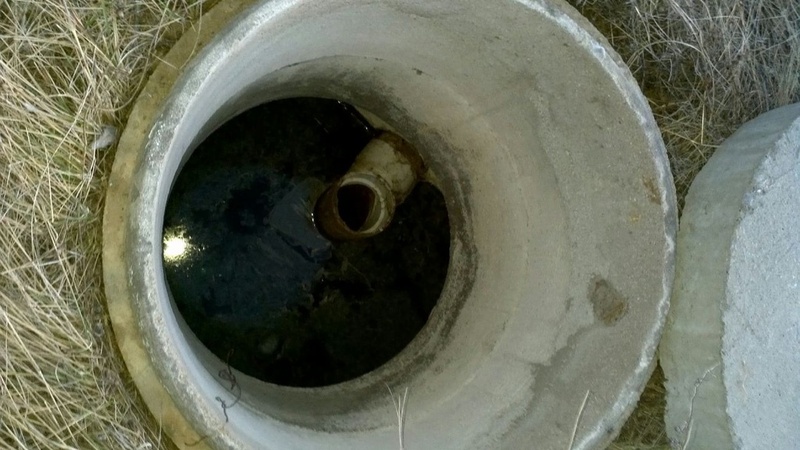 Credits for the disintegration and decomposition that occur in septic tanks go to the aerobic and anaerobic bacteria. They attack the organic solids and break them up into liquids and gases. (Gasses rise and since a septic system does not have baffles from house to tank, they rise and escape out… yes, …the vents (or traps inside house if water is not in them)). A certain amount of waste matter cannot be decomposed so it forms sludge at the base of the tank instead. The action of bacteria is vital to the function of a septic tank. 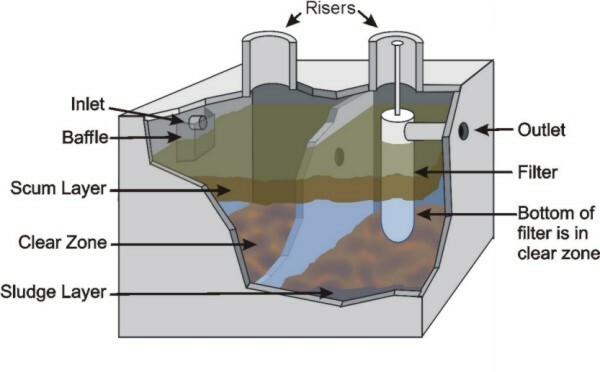 Balancing the level of sewage liquid in the tank is not an issue because the right amount of liquid is evacuated in the presence of new sewage. The bottom of the tank is where the fresh sewage is directed through the help of a baffle at the inlet of the tank. This allows fresh sewage to decompose in time and not be discharged immediately. This purpose is easily achieved through the combined efforts of both baffles at the inlet and outlet of the tank. The attached cut away shows a typical tank, both pvc and concrete are similiar in design. As you can see liquids do not leave tank until nearly full (outlet). Also in a system of this age, or a new one installed (pvc usually filled with water to keep it from being crushed during backfilling), if it is not staying full, it has a leak, (not good). While this is not a guarantee of the condition of the system, this explanation should give you a fairly good understanding of why it is full. BE PRO-ACTIVE! OBTAIN SEPTIC DOCS, SUCH AS DESIGN, PERMITS, DETAILS. LOOK AT THE AREA OF THE TANK AND FIELD. SEEK SOMEONE THAT HAS KNOWLEDGE ABOUT THE SYSTEMS. DURING YOUR INSPECTION PERIOD. THE ABOVE BROKER AND BUYER DID NOT INVESTIGATE DURING THE INSPECTION PERIOD AND SHOULD HAVE TO SATISFY ANY CONCERNS. INSPECTION WOULD INCLUDE; FIELD EVALUATION, PUMPING, TANK INSPECTION. YOU SHOULD NOT DRIVE OVER YOUR TANK, LINES OR FIELD. YOU SHOULD NOT BURY THE CLEANOUT THAT IS LOCATED NEAR HOUSE. THIS CAN DAMAGE ANY PORTION AND CAUSE LEAKAGE OUTSIDE THE INTENDED AREA AND CAUSE FAILURE, A MESSY STINKY FAILURE. IN WINTER PRONE AREAS DRIVING OVER THE LEACH FILED/DRAIN FIELD CAN FORCE FROST DOWN AND FREEZE THE FIELD. YOU SHOULD NEVER CLIMB INTO, HANG INTO THE OPENING. NEVER OPEN WHEN ALONE. NEVER LEAVE LID OFF. ANY OF THESE CAN VERY QUICKLY LEAD TO SOMEONES DEATH. If you lived in an urban area which had city sewer services and you were used to using a garbage disposal or putting all kinds of everything down the toilet or if you do multiple loads of laundry every day. Please talk to your Realtor about the life adjustment you will need to make to live happily with a rural waste water/septic system. INFORMATION DEEMED RELIABLE BUT YOU SHOULD BE PRO-ACTIVE AND SEEK THE PROFESSIONAL OPINION OF YOUR GENERAL CONTRACTOR, A SEPTIC SYSTEM INSTALLER OR YOUR COUNTY SANITARIAN.